Looking online, it’s clear to see that many people have written this off as a parody of Marvel’s Fantastic Four. There’s no wondering why people believe that, it was certainly conceived as such. 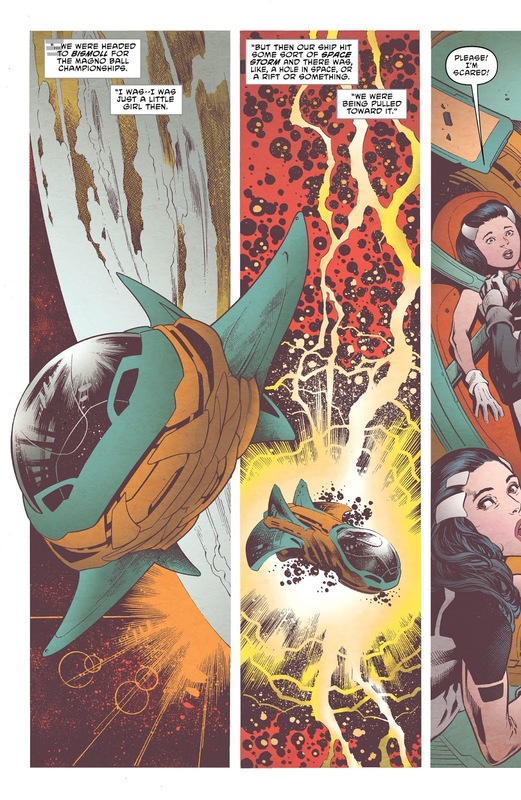 But now, in the second issue, we get to see if the concept has legs. 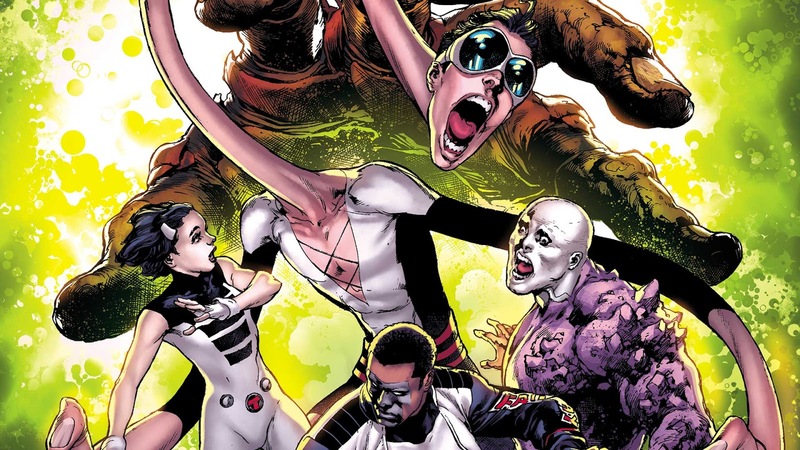 And you can find out without even reading it by checking out my review of The Terrifics #2! But you might want to check out the comic book too, make sure my findings are accurate. Getting the team together is the easy part: having the team work well together is another. And in fiction, it’s not actually about whether they can unify towards a common cause, but whether they’re entertaining to see. Dr. Smith from Lost in Space was certainly a monkey wrench in the normal proceedings of the Robinson Family, but he turned out to be so integral to the show that its last season is practically a showcase featuring him, the young boy, and Robby the Robot. So just because a member of a team is argumentative or lazy, that doesn’t mean that the team would be interesting to read about without them. The foil of this team, likened to the caustic friendship between Ben Grimm and Johnny Storm over at the House of Ideas, is the embittered rivalry between Metamorpho and Plastic Man. 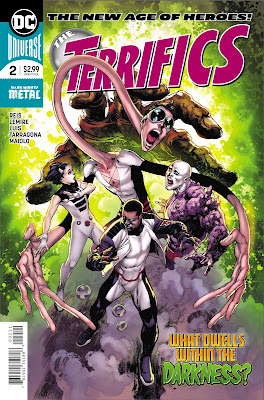 We see it in this issue as they, along with Mr. Terrific’s help, try to wrench an antenna from the distress beacon left by Tom Strong. 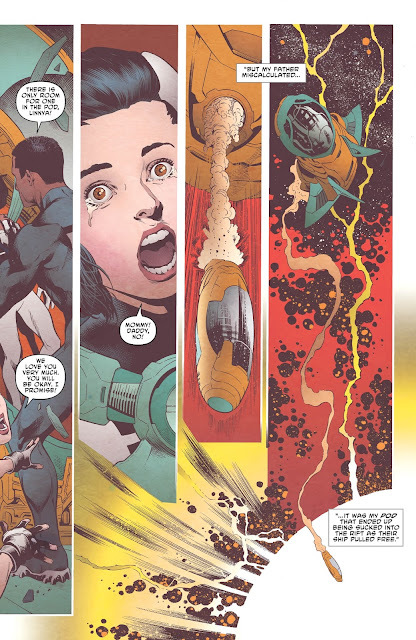 Removing it wakes up the Unicron/Fake Galactus upon which they stand, but before we get there is an opportunity for Plas and Rex Mason to squabble…and it’s a little forced. I know Jeff Lemire to handle relationships like this well—the budding bromance between Green Arrow and Animal Man is the greatest casualty of Justice League United’s premature cancellation—but here, in the second issue, it just isn’t ringing as true. We do get an origin story for Linnya: she was jettisoned when peril threatened her family’s vacation, but instead of escaping the Dark Multiverse, she was sucked into it while the rest of her family got away. We also get a good scene of teamwork when the gang escapes the Dark Multiverse just before Fake Galactus is about to reach through the portal and make an obscene gesture; his finger tips are shorn off, which is gross. 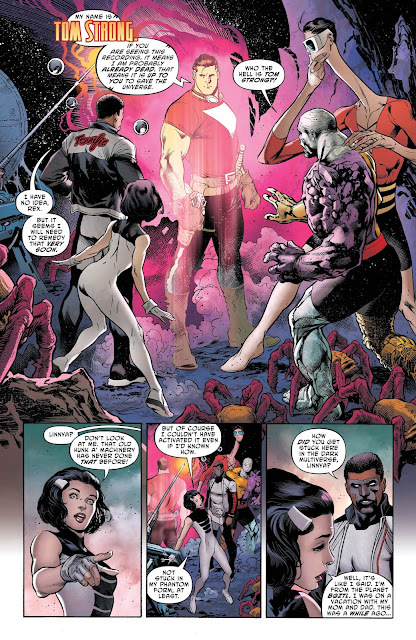 But the forced rivalry between Plastic Man and Metamorpho, as well as a pretty lame contrivance to keep the Terrific Four together (which is that some kind of technological spell from the antenna they wrenched from the Dark Multiverse keeps them bound) had this issue falling a little flat. But it’s a pretty good-looking book, so it’s still worth your three bucks. The second issue takes a little time to familiarize ourselves with these characters: very little time. They fall into familiar narrative types and behave perfunctorily within the structure of comic books. It didn't feel very terrific. Michael Holt is an empty rocking chair, a broken mirror-watch, a prickly plant, a black door-cat-dispenser. Spreads misfortune where he walks. A valid observation.